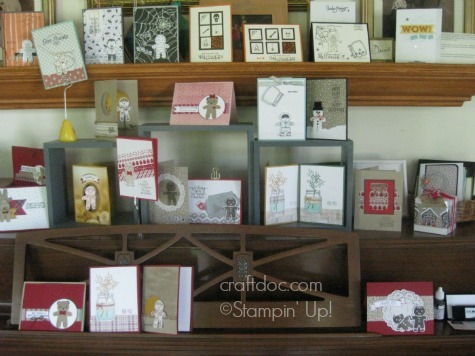 Time for another Stampin’ Up! series of posts. This time I went wild with the Everyday Jar Framelits Dies and the Cookie-Cutter Punch. The matching stamp sets are Jar of Love, Jar of Cheer, Jar of Haunts, Cookie-Cutter Christmas and Cookie-Cutter Halloween. Here’s a peek at some of the projects I will be sharing. I change out the display each month for my class. This was everyone’s favorite class card – the Teddy Bear Christmas Card. I also showed how to make it into a Baby card by changing the sentiment and using a lighter cardstock. To use the Cable Knit Dynamic folder, first spritz the cardstock on both sides with water (if you have trouble with the cardstock cracking) and place in folder. Your sandwich is Big Shot Platform, Folder, one cutting pad and place spine first through the machine. You do not use a second cutting pad because of the extra thickness of this folder. Stamp the ears on your white circle or oval before adhering your teddy bear. Hint for using the Cookie Cutter Punch. 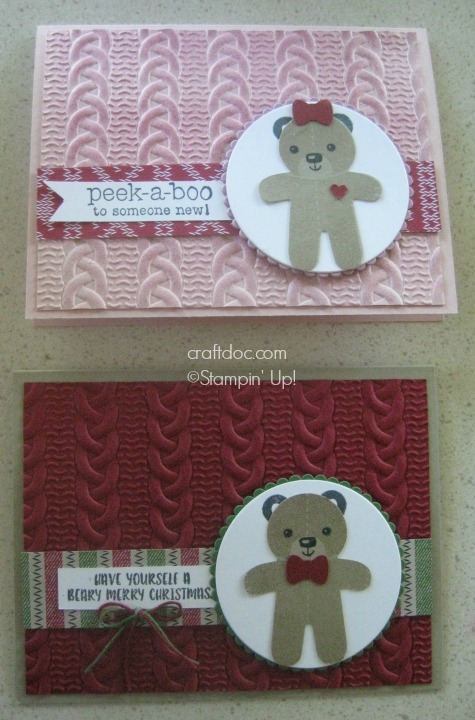 If you do not want to waste cardstock, use 5-1/2 by 2 inch strips to stamp on. Stamp the cookie-cutter so the “feet” are towards a short edge. You can get 2 from each strip.